Flight has always been a major fantasy attached to driving. Since the first cars shimmied over dirt roads and cobblestones, motorists have imagined themselves at the controls of flying machines. And if they weren’t already of that mindset, advertisers and dealers made sure to drive the point home. They still do. Who among us hasn’t been told by a salesperson to “check out the cockpit” of a ride they were trying to sell us? Some manufacturers actually did make airplanes at one time or another, like Ford, Piaggio, Voisin, SAAB. Many others produced aero components: BMW, Rolls Royce, Packard. 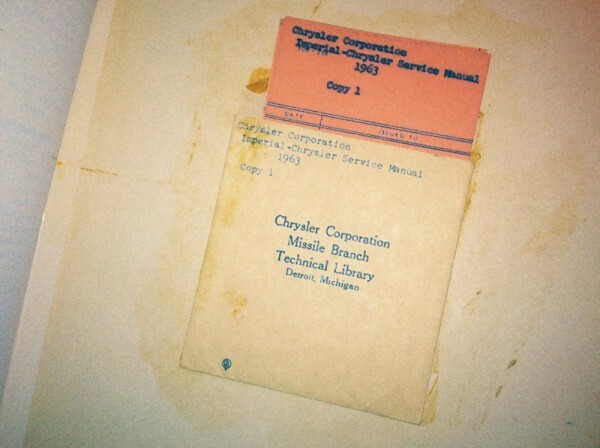 When I bought a repair manual for my ‘63 Imperial, I was pleased to find that inside the back cover was an intact pocket and card from the Chrysler Missile Branch library. However tenuous the connection a carmaker’s products might have to aircraft, few were shy about using aeronautic (and aerospace) references to spice up whatever land bound bucket of bolts they had to offer. 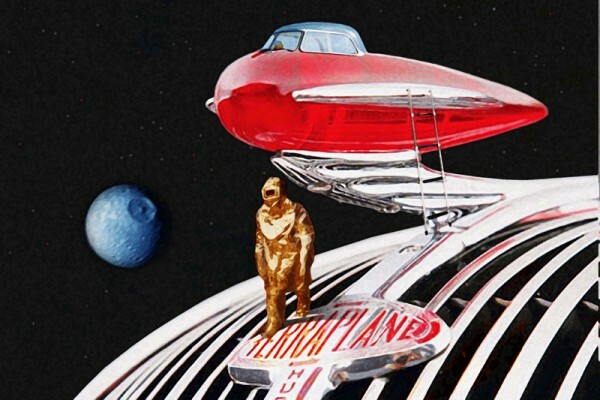 Having no established design idiom for rocket ships, Hudson were free to employ art deco fantasy when fashioning a hood ornament for their aptly named Terraplane in the late ‘30s. A prospective buyer who slid behind the wheel sighted over a translucent ruby orb that appeared to have landed on Planet Terra after escaping a Buck Rogers film short. During WWII, the German V-2 set the standard for popular ideas of rocket design that would persist through the early 1950s. The Nazi wonder weapon‘s form was transcribed directly into chrome for the finned cigar heading toward a golden postwar world on trunk of an Oldsmobile Rocket 88. But the cold warriors–and war of the worlders–worried: If the rocket is flying TOWARD Earth, where did it come FROM? New designs for military aircraft proliferated as Cold War fears kept aeronautical designers busy. 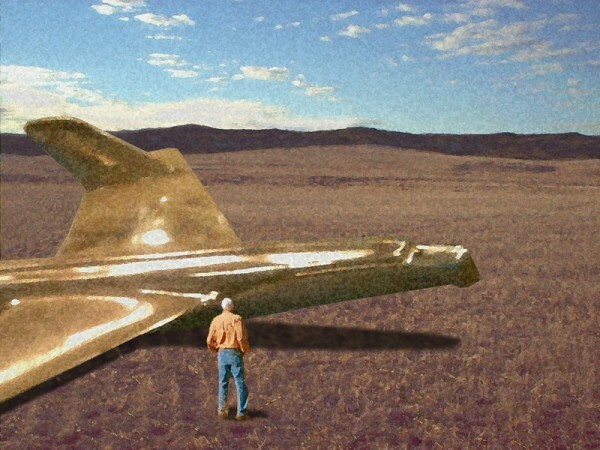 Aero technology advanced so fast and new warbirds arrived so often that they were sometimes mistaken for alien craft, or worse: secret Soviet super planes. These sleek weapons made their presence felt in automakers’ studios, where assorted side spears, light pods, fender crowns and hood ornaments took on swept wings and rocket fins, selling American Might to Americans. GM cast a modern Phoenix when they grafted an accipiter’s head to the nose of an F-7 Cutlass fighter and perched it on the hood of the mid-century Chevy, evoking a wartime propaganda animation in which an American bomber was transfigured into an arrow-wielding eagle. As late as 1959, Cadillac’s design brief included parking light pods lifted directly from the intakes of Boeing B-52 bombers. And its tail lamps suggested hot gases shooting rearward to help push 2 1/2 tons forward on low pressure tires. It brought the spaceship look to a place where geometry’s most magical shape, the circle, looked almost ungainly formed into wheels that broke he long sweep of a Caddy’s bodyside. By now, John Q. Public had an idea of what a real rocket looked like, and it didn’t resemble a winged cigar. 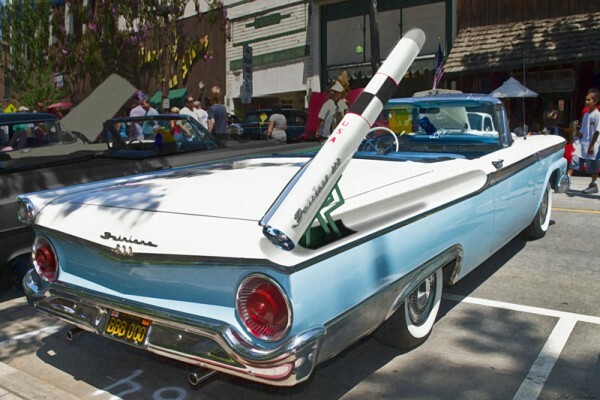 The elongated cylinders atop the haunches of ‘59 Pontiacs and Fords would be among the last of the escape velocity styling cues. They referenced the dark side of rocketry: the intercontinental ballistic missile. But ICBMs cast dual shadows. 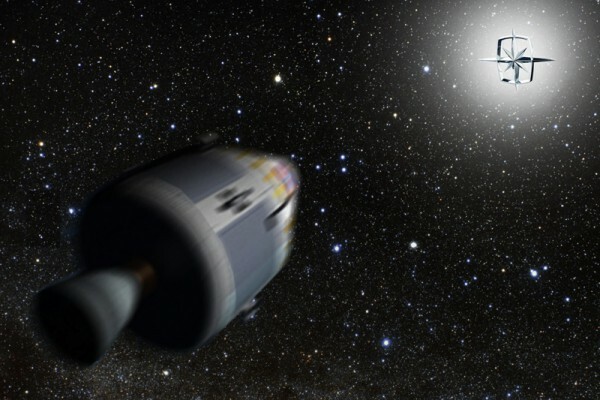 Not only could they carry destruction, they also transported human explorers into space. Automakers certainly didn’t shake hands with warmongers in their boardrooms over a deal to sell symbols of nuclear annihilation. As before, they sifted through timely imagery to proffer symbols of power, speed, security–and hope. Your last picture makes an interesting point. Real outer-space stuff, whether satellites or capsules, is not aerodynamic at all. It doesn’t need to be. 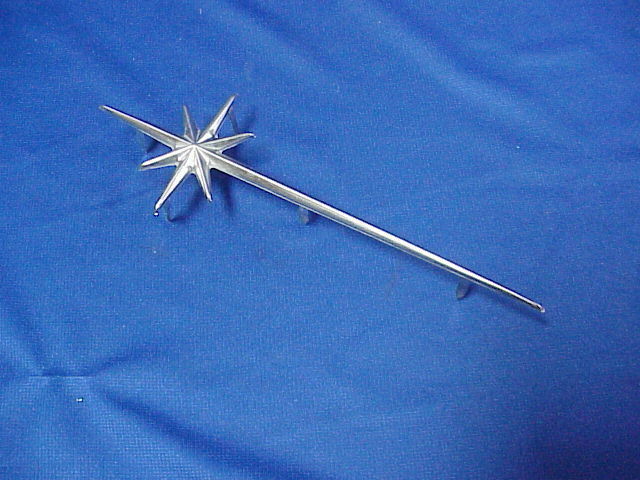 It tends to show ungainly bare mechanisms without any outer case or body. In other words, automobiles of the 1890-1905 era looked more like real space stuff than any later cars! Yeah, it only needs to be slippery to escape the atmosphere. And here’s a another space question for you guys: If you are in in battle, wouldn’t there have to be an open mic between warring ships in order for a combatant to hear the enemy’s weapons? Photons don’t make noise, right? Right, there is no atmosphere in space so there’s no sound. 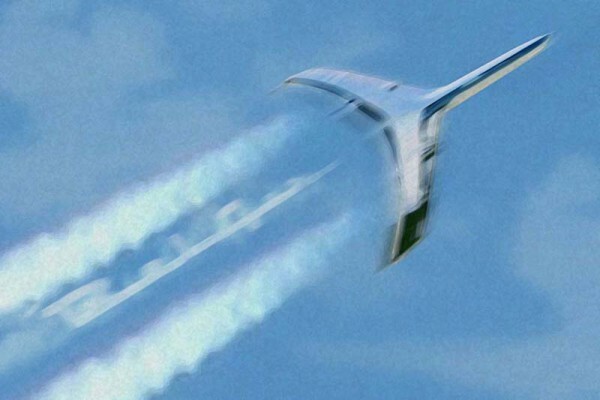 A lot of the spaceship sounds when they shoot or fly around in sci-fi movies and TV shows are not realistic. Blast effect is no good, either. This is why for weapons, you need hit-to-kill kinetic rounds, fragmentation near-miss, or a nuke close enough to fry. If you think about it, it might be even more frightening to see a round coming at you silently. Some day, some movie maker should do it right. Having never been in air combat, I would guess that even in piston planes, the only guns you hear are yours, since the enemy’s guns are washed out by your engine and prop noise. All this ties into music history too. Some say Jackie Brenston & His Delta Cats song Rocket 88 was the first Rock & Roll song. It almost certainly was not but it sure is fun. 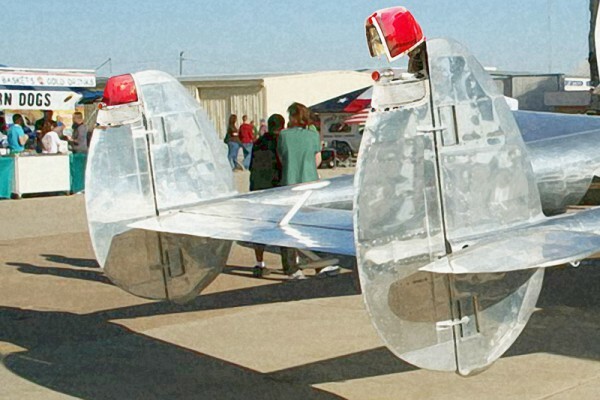 The P-38’s vertical stabilizers are similar to those of the earlier Model 10 Electra (flown by Amelia Earhart), & were retained in the Model 49 Constellation. Nothing jet-age about these! BTW, those mass balances in the middle of the horiz. stabilizer were put there at the insistence of the Army, not Lockheed, who already concealed mass balances inside the fins. Kelly Johnson claimed the Army ones did nothing but kill a few pilots trying to bale out. Love it! The P38 tail lights are brill. As is the rest. Thank you for making my day. I dream stuff like this, but can never quite remember all the details in the morning. And I haven’t made the time to learn PS. But now I don’t have to. BTW, I missed the “Bel Air” in the contrail the first time around. Nice. Me too. That is fabulous! Fantastic post. I’d never noticed the B-52 nacelles were dupes for the Caddy turn signal pods. And I’ll never be able to look at a 59 Ford without seeing the ICBM launchers now. Great illustrations! 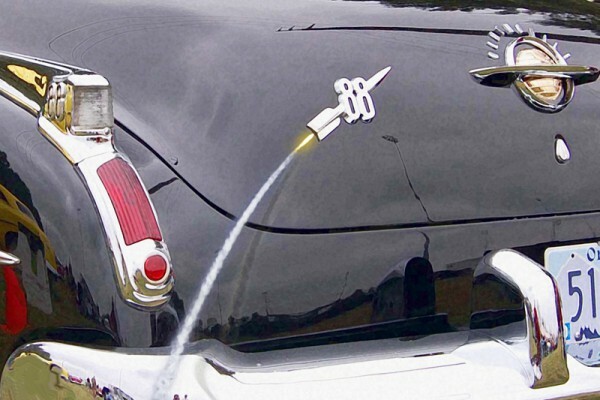 The jet-age styling elements are ubiquitous in the 50’s but I’d never noticed certain ones, like the ’59 Ford’s fins. Thanks for the props, everybody. I’ve always wanted to do this story, but never found an outlet for it until CC. This is terrific – it really drives the point about the inspiration the aerospace industry provided the automotive industry. These pictures are awesome! You have captured the 1950s automotive design ethos. Great fun, and also very true. It still goes on – here in the UK, the recently deceased Jaguar X type had headlamps clearly modelled on a pioneering British aiercraft. Good catch. Several other early, large Brit jets had embedded engines, like the V-bombers. 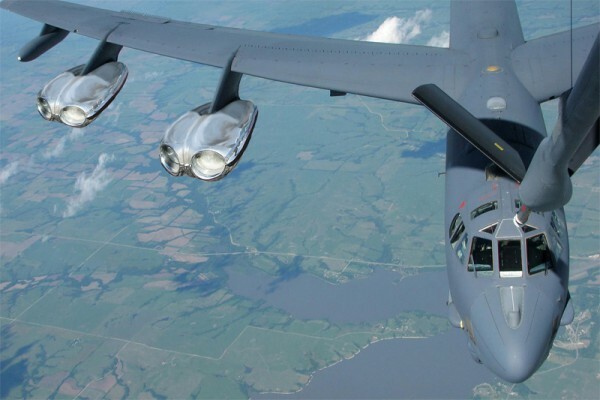 Slick looking, high ground clearance, & more centered thrust, at the expense of maintainability & more difficulty in upgrading – note that there was no trouble converting KC-135s to high-bypass turbofans. BTW, a Handley-Page Victor & a VC-10 were displayed at a March AFB airshow back in the ’80s. Surely the Victor is as close as any real aircraft could be to Flash Gordon spaceship styling. Also, when a turbine wheel comes apart, uncontained, which does happen, the damage is much more severe. Yes, that’s a good argument for podded engines, though to be fair I’ve not heard of many cases of turbines grenading like that. The Me-262 introduced pods, but I suspect Boeing, who with Douglas popularized podded jets, was paranoid after what they went through with the B-29, in which early versions of the Wright R-3350 radial often caught fire (being made partly of magnesium) & burned through the main spar, causing the plane to fatally spin in. Another reason for podded engines on big jets like airliners and heavy bombers is that you can actually use the engines as damping weights for the wing, which is a handy way to manage wing flex while keeping the wing thin for lower drag. It remembered me to “something”… Now that’s IT! Great fun. I’d never realized that the Cadillac’s tribute to the design included the ability of the tail light to flip open (for gasoline, in the automotive case). This kind of brilliant scientific discussion is what we have been missing here at CC. Who knew that all of those features we grew up seeing on old cars started out as the high tech products of the military-industrial complex! Groundbreaking stuff. The final picture is a brilliant depiction of a rarely seen astral phenomenon, which astronomers have dubbed the Continentus Insignium. This is the perfect opportunity to show off a picture I once took of the same formation in its beginning, or Premier, stage. Some day, one of our amateur CC astronomers should get around to documenting the entire process of transformation. There was undoubtedly a supernova involved. 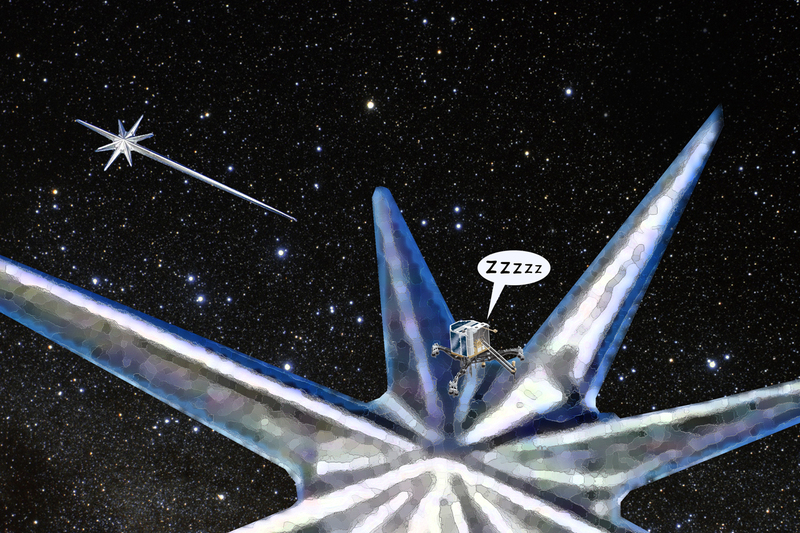 Shhhhhh, JP, don’t wake him…. Very, very nicely done Barry. The other piece of aerospace-industry design that found its way into the automotive world in a big way is the wasp-waisted (“Coke bottle”) shape. This eventually carried over into automotive design, one of the most dramatic production examples probably being the C3 Corvette. It was a major break with the ethos of the ’50s, which was basically slab-sided; the sides might be curved or broken up with creases and trim streaks, but there isn’t really any distinction between the forms of the body sides and the front and rear fenders on that side. Instead, the “area rule” shape exaggerates the fender forms while still making them an integral part of the overall form of the body (rather than separate entities, as was the case before the late ’40s). 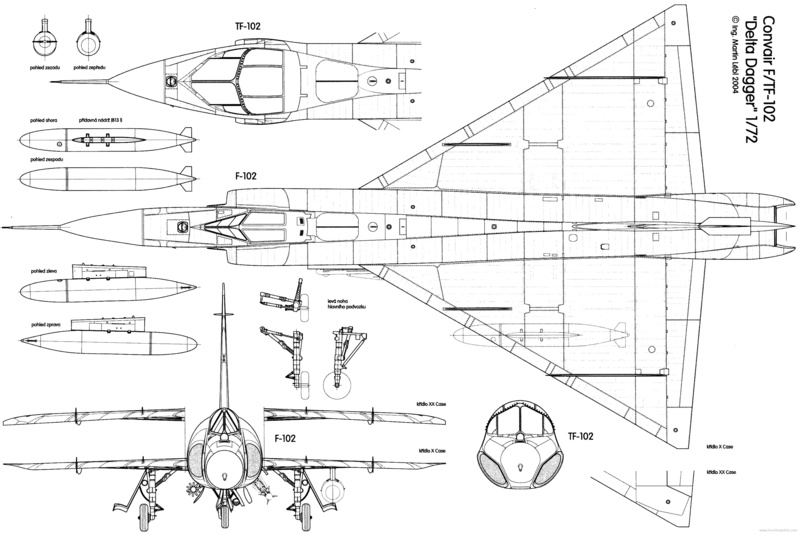 Actually the F-106 had the Area Ruled fuselage, not its unsuccessful Mach 1.2 predecessor the F-102. There’s very little taper in this drawing, what there is looks like it’s due only to the inlet transition. The Northrop T-38 is a clear example of Area Ruling, still in use. They seem incredibly fast after leaving the runway. The original YF-102 prototype was not area-ruled, but the subsequent YF-102A was. If you compare photos of both in plan view, the difference is pretty obvious. 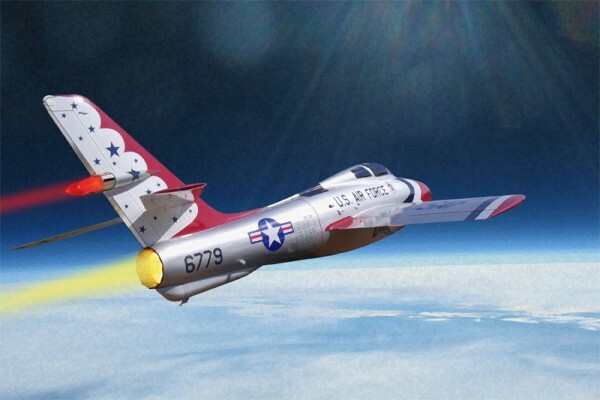 The application of the area rule — of which the F-102 program was one of the first, if not the first, U.S. examples — is why the production F-102A was able to reach Mach 1.2. The non-area-ruled prototype had great difficulty breaking the sound barrier in level flight. The F-102 was a disappointment (getting it to meet the original specification, which wasn’t very realistic to begin with, resulted in a more or less new aircraft) and like most ’50s jet fighters it was buggy for quite a while, but I wouldn’t call it unsuccessful. Convair built more than 900 of them (compared to 340 F-106s) and they were in service for more than 15 years. The F-106 had much superior performance, but the F-102 certainly wasn’t a complete disaster. I am not sure why, perhaps because my wife and I spent our most rewarding professional years in the airline Industry? But all four of our vehicles, a Ford Thunderbird, Chrysler PT Cruiser, Mini Cooper convertible and Honda Shadow all utilize wings in their trim/and or insignia. Thanks for that reminder of where the ’59 Cadillac Pods came from…The B’52s. and those taillights were too cool. i remember as a kid trying to understand the concept that they had gone out of style, they were looked on with disdain when i was 3 in 1962. The same holds true of the Ford, However, I Think of Jello Molds On Aluminum Pie Plates when I Look at those taillights. Fantastic imagery here ! . I hope all and sundry have a GREAT THANKS GIVING .